In 1996, local running legend, former race director, and former Austin Runners Club President John Conley organized a race series to help runners prepare for the Austin Marathon, then in its sixth year. The races were chosen to increase in race distance each month, from the mile to the marathon. Over the years, the series has evolved as races have come and gone and sponsors and organizers have changed hands. The one constant is the drive that runners exhibit in training, competing, and completing a challenging series. Today the Austin Distance Challenge is a series of five of the most prestigious local running events starting in October and leading up to the Austin Marathon and Half Marathon in February. Two tracks are available to runners: the full track, which culminates in the full marathon, and the half track, which culminates in the half marathon. The races still increase in distance as the series progresses, and runners of all ages and abilities still use the series as a key part of their training for the big show in February. The series begins with the 80’s 8K organized by Run Free Texas, another non-profit running organization, held in Cedar Park in October. Then in November the series continues with the Run for the Water ten miler in central Austin, organized by the Gazelle Foundation, a non-profit group that provides wells for water in Burundi. In December the Austin Runners Club’s own Decker Challenge Half Marathon takes place around Decker Lake on the east side of Austin. The 3M Half Marathon follows in January, with a downhill course from north to central Austin. Finally, the Austin Marathon and Half Marathon take place in downtown Austin in February. These races appeal to runners across a spectrum of experience and abilities who choose to take on the challenge of the whole series. In the 2015-2016 series alone, the Distance Challenge finishers included a teacher who won the Decker, 3M, and Austin half marathons women’s open divisions as well as a woman who ran the series while pregnant and a man who ran every race barefoot. Every runner has a unique story, but they share their passion and commitment to their running. In its 20th year, the series is hosted by the Austin Runners Club (a 42 year-old local nonprofit) and raises funds for a beneficiary charity, which in the upcoming series will once again be The Trail Foundation, an organization that protects and enhances the Ann and Roy Butler (Town Lake) Trail. For many citizens and visitors, the Trail represents the best Austin has to offer: outdoor recreation; a scenic, natural environment; and a diverse, vibrant mix of people, and ARC is proud to put on this series in support of The Trail Foundation. Many participants in the Distance Challenge train on the Trail for each race, making the two non-profits a natural fit in promoting running through training and racing. This volunteer-run series is managed by runners for runners and attracts approximately 500 participants. It truly is a challenge to plan, train, stay healthy, and complete the series, and the Distance Challenge is there to support the participants along the way with special benefits including customized running gear and special treatment at each event. The benefits begin from the moment of registration, when runners can choose to register for all of the races at once, taking advantage of discounts as well as simplifying the registration process. Registering for the series and each race separately is also an option. When runners register for the series, they automatically receive a technical training t-shirt that they can pick up at the first race’s packet pick up. One major benefit is the Distance Challenge tent that welcomes participants in the finish area at the races, offering food, beverages, and fun. As an added incentive the series also offers “door prizes” that the runners will enter into a drawing for. Also available at the finish line tent for each race is a magnet puzzle piece collectible that, once assembled, can be framed or posted on the refrigerator. After the series is over, finishers are treated to a post-series party where all who complete the series receive a running jacket and top runners overall and in each age group are recognized with awards. 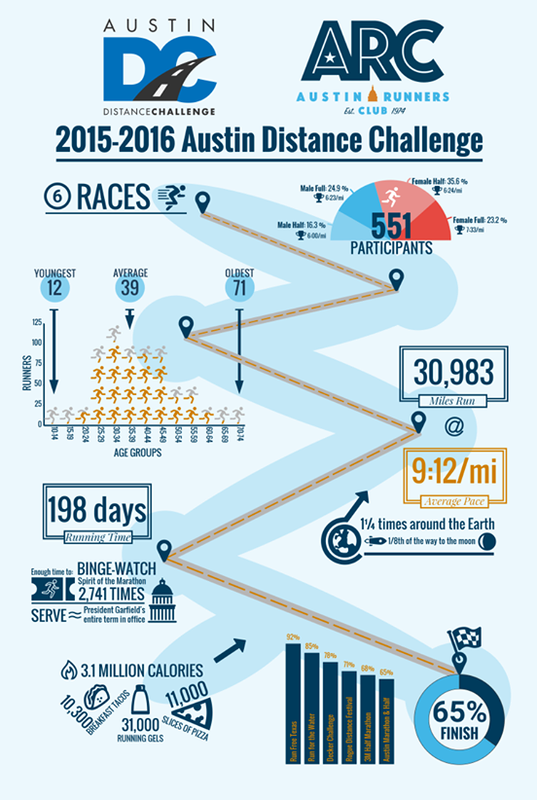 The Austin Distance Challenge represents a goal worthy of the commitment and effort that runners have put into it for the past 19 years, and the Austin Runners Club is pleased to offer it again this year. Registration is available for the all-in-one package through September 30, and individual registration will be offered through the first race for runners who participate in it. For more information and to sign up, visit http://austinrunners.org/distance-challenge/.